By the time The Ghoul was released in July 1934, to lukewarm reviews and box-office in America, Boris Karloff had already returned to the U.S. The long-awaited script for The Invisible Man still wasn’t ready, undergoing seemingly endless re-writes in James Whale’s quest to hit the right tone. Meanwhile, he absorbed himself in a sincere desire to better the conditions for Hollywood film actors. He attended secret meetings to discuss with others how they might replicate the success that Actors’ Equity enjoyed in representing theatre members (which had resulted in the first ever theatre employees’ strike in 1919). He and his colleagues knew they would have to bide their time until movie producers made the kind of exploitation mistakes that would persuade the stars to join forces with them into a powerful enough body that could be taken seriously. Whilst the Screen Actors Guild was being formed, the beginning of June saw Karloff briefly in exactly this type of fractious negotiation with Universal over his contract option being picked up for a new term. He was due to rise from $750 a week to $1250, representing two agreed steps of increase of $250. He suggested waiving the first and going immediately to the higher amount due. The studio refused, but the matter was smoothed with a new five-year contract that earned him $2000 and gave him the attractively rare carrot of a guarantee that he would be billed on publicity as ‘Karloff’. 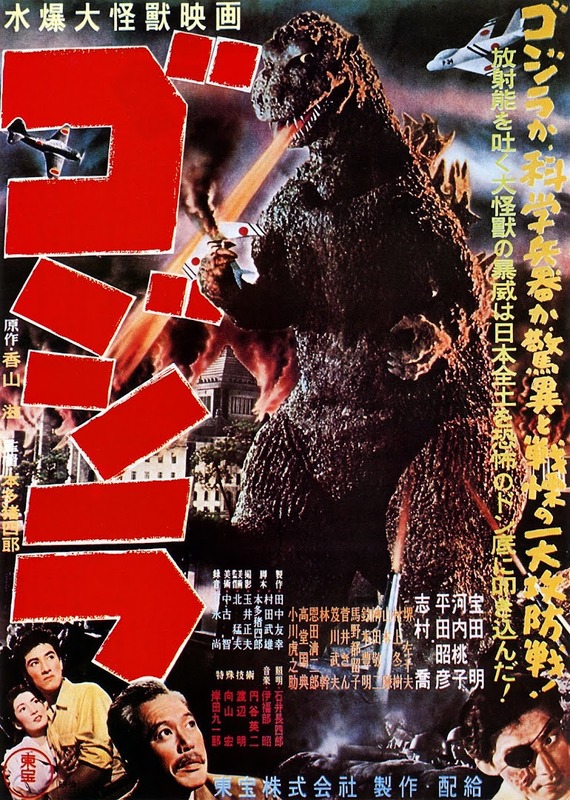 Intriguingly, Variety reported that The Return of Frankenstein would be the opening project. Karloff’s filming schedule at first moved ahead without Universal. He worked with the emerging genius John Ford for RKO’s WWI drama The Lost Patrol, shot in the brutal heat of Arizona, which sapped the actors’ energy and the equipment. Soon after its release, garnering mixed reviews about Karloff, praising his intensity and criticising a ‘theatricality’ in his performance, he was part of a historic power-play off-screen. In good company with 22 other star actor signatories including Gary Cooper, Frederick March and James Cagney, he resigned from the Academy of Motion Picture Arts and Sciences. ‘Dissatisfied with the fashion in which their interests have been represented in NRA code hearings in Washington’ according to Variety on the 2nd of October, the ex-members felt that their self-formed Screen Actors Guild would protect them better than the code, which tried to bail out the economy in part by imposing measures counter to actors’ livelihoods - for example banning producers from bidding competitively between themselves over actors, (which would effectively stop performers from a vital aspect of financial betterment). The code had also ratified, without consultation, a move that forced a ceiling on actors’ earnings of $100,000 and enabled producers to control the licensing of performers’ agents. These two rules alone clearly established that producers were being allowed unequal bargaining power. It was only a few weeks before the Guild’s membership expanded to 4,000 members under its inaugural president Eddie Cantor, who used his influence with U.S. President Roosevelt to ensure the offending sections of the code were excised. Following his evil Ledrantz in the nascent 20th Century Fox’s Napoleonic drama The House of Rothschild, another historic moment happened for Boris Karloff and horror fans at the start of 1934. It was to mark his first of eight on-screen pairings with fellow star Bela Lugosi in horror cinema – The Black Cat. Karloff was back in the Universal family again with a fee of $7500 for the four-week shoot. Lugosi accepted an offer of $3000, sadly indicative of his waning bargaining power by comparison. (This would see him gradually descend into increasingly shoddy parts with only his remarkable Ygor in 1939’s Son of Frankenstein to worthily showcase his versatility). Lugosi had just finished one of the many stage Dracula tours he would be forced to take on the road over the decades. Karloff and Lugosi benefitted from the directorial and visual flair of Edgar G. Ulmer, a former set designer in German theatre and then film, most notably on The Golem and Metropolis (reviewed here respectively on 28/12/2015 and 5/02/2016). His art design for Poelzig’s house in The Black Cat featured much that recalled German Bauhaus architecture and an expressionistic use of light and shadow. Ulmer’s unity of vision was further strengthened by his co-writing of the screenplay with George Sims, a mystery thriller writer who later served in WWII in the Army Intelligence Corps and then became a rare book dealer, a grounding in reality that made his eerie thrillers particularly highly-regarded. The Black Cat took the title of Edgar Allen Poe’s story yet had no connection with it. 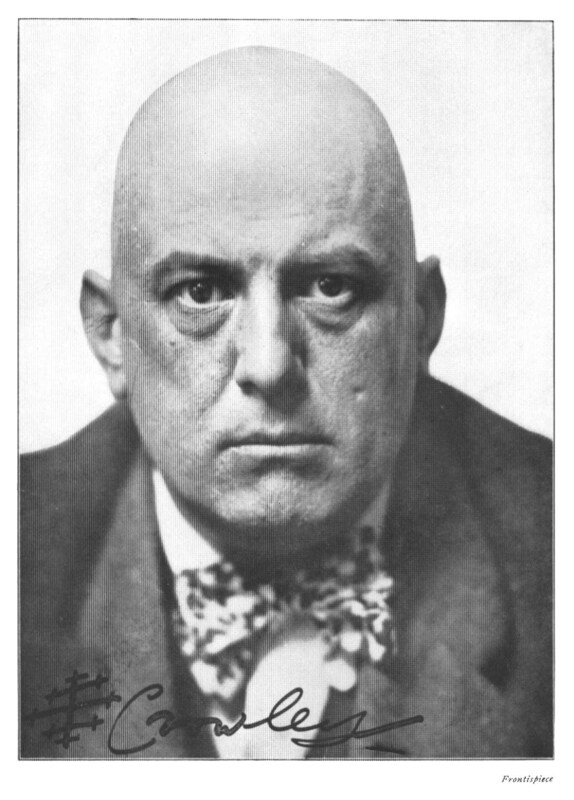 Instead, it was partly inspired by a court case surrounding famous British occultist Aleister Crowley, the self-styled ‘Great Beast 666’ whose far-reaching influence extended to include appearing as one of the 20th century’s cultural icons on the cover of the Beatles’ album Sgt. Pepper's Lonely Hearts Club Band. Stephen Jacob’s superb biography Boris Karloff: More than A Monster details how Crowley had taken umbrage at the reference in his friend Nina Hammett’s autobiography Laughing Torso that: “He was supposed to practise Black Magic…and the inhabitants of the village were frightened of him.” Crowley sued for libel on the basis that his was the more benign White Magic. However, his case was thrown out after an occult student of his in Sicily, Betty May Loveday, testified that her husband died as the result of a ceremony involving drinking the blood of a sacrificed black cat. Ulmer and Sims were inspired to blend some of this grisliness into the creation of Hjalmar Poelzig, Austrian architect extraordinaire and Black Magic devotee played by Boris Karloff. With his stone-faced demeanour, black gown topped with an occultish pentagram necklace and hair oiled to a widow’s peak, he is every inch the secret Satanist – aided by Jack Pierce’s much simpler make-up than for previous horror roles. The other blueprint in creating the character was the real-life German architect Hanz Poelzig. Lugosi, meanwhile, is allowed a pleasing change of pace into a more humane, even heroic figure, that of Dr Vitus Werdegast. (With names like this, perhaps the writers were masquerading as practising sadists to actors too!). His character is a promininent Hungarian psychiatrist who suffered the devastating loss of his wife and has only recently been released from the ravages of 15 years in a Siberian prison camp. “After 15 years….I have returned”. (This underlying deep-seated trauma was based on Ulmer’s study of the PTSD effects upon survivors from the French fortress Doumont following World War One). Despite the heavyweight aspect to the material, Ulmer found Karloff bringing a continual levity, pre-take, to a part he struggled to regard seriously, whereas Lugosi exuded an intensity of passion that Ulmer had to judiciously cut away from at times. Due to a booking mix-up on a train to Hungary, he is forced to share a compartment with a canoodling honeymoon couple, writer Peter and his wife Joan Allison (David Manners and Jacqueline Wells). Although Manners had already been the 1931 Dracula’s John Harker opposite Lugosi, a residual aloofness of manner from the older actor discouraged Manners from a friendship off-camera. Nevertheless, Lugosi portrays Werdegast as a tweedy, avuncular gentleman of impeccable manners and unlike almost all of his recent post-Dracula roles, this is not a pose that dissolves to reveal a stiff, glowering Svengali of evil. When the new friends’ bus crashes, hurting Joan, it forms a useful plot device to gather all three together at Poelzig’s home, a ‘friend’ of Werdegast, built on the foundations of Poelzig’s old command post of Fort Marmarus. Their host appears with a strident music cue and the forbiddingly focused gravitas of Karloff that enables Lugosi to play more humanely opposite him by contrast. Joan is put to bed and treated by Werdegast with the hallucinogenic Hyoscine. The young couple are thus not privy to the seething real animosity Werdegast has nurtured toward Poelzig since the war, his home “..built upon the masterpiece of war…the masterpiece of destruction”. Poelzig had given up the fort to the Russians, sacrificing 10,000 soldiers and now Werdegast is back “To kill your soul….slowly”. It’s amusingly ironic to note David Skal points out in The Monster Show that Vitus Werdegast literally translates as ‘Life becomes guest’. He demands to know where his wife Karen is, which Polezig perversely satisfies by showing her dead body perfectly preserved on display in a glass cabinet. This morbid sight overcomes Werdegast with grief. Poelzig argues that his gallery of others like her are the living dead, preserved as though they are still alive. Good thing he doesn’t yet know that Poelzig also sleeps with her beautiful blonde identical double daughter. (There’s only so much a concentration camp survivor can take on his release). When Joan enters in somewhat of a trance state, the sight of a black cat causes Werdegast to react with fear. Poelzig tells his guests that Werdegast has a serious phobia of cats, whom Werdegast feels are “deathless as evil”. There’s a tangible atmosphere of death over the whole film in fact, an unshakeable funereal fog of mourning that works very well. 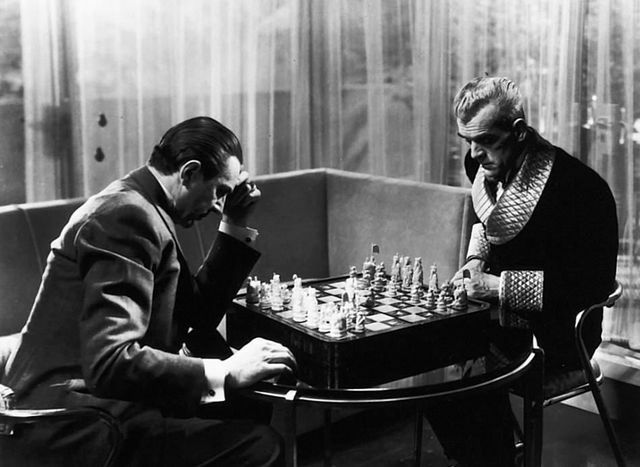 The theme is constantly referenced by the two combatants who eventually settle down to the literal game of chess that they’ve already metaphorically begun since Werdegast arrived. They agree that the safety of the Allisons will be the stake. Werdegast also introduces another lit fuse to keep things darkly simmering – he reminds Poelzig’s undertaker-like Majordomo, (Egon Brecher) who is secretly working for him, that the house sits on top of a colossal store of dynamite. This is not to suggest that Ulmer lacks the confidence to add a little comic relief into the mix courtesy of a group of Gendarmerie who arrive to take statements about the bus crash. The harmless squad bicker amongst themselves about which is the most beautiful local village, resembling chocolate soldiers rather than officers of the law. Their quaint ineffectuality is enhanced even more when the Allisons ask for a lift (to flee what they suspect is a madhouse) and are regretfully told the policemen only use bicycles. Eventually, the mask of decorum slips off. By the time Poelzig savours the observation that “Even the ‘phones are dead”, the guests are well aware that it’s time to leave their key at reception as events build to a nightmarish climax. Joan is carried away by the hulking man-servant Thamal (Harry Cording), while Poelzig plays the Toccata and Fugue in D Minor signalling his Phantom of the Opera ghoulish intentions. He presides over a well-attended underground Black Magic ritual, “the rites of Lucifer” while Joan is visited in her room by Karen’s namesake daughter. Somehow, Poelzig knows this and breaks away from demonic business long enough to reprimand Karen in a genuinely unnerving off-screen fatal ‘reprimand’ from which she shrieks. Such is Karloff’s unholy energy that it takes Thamal and Werdegast to bring him down, seized even as Werdegast is by the grief-fuelled anger of seeing his daughter on the slab at the hands of Poelzig. 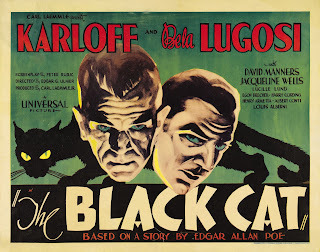 Those who think Lugosi has been neutered in this film need have no fear. He suspends Poelzig on his own rack, stripping him of his shirt and teasing his captive with “Did you ever see an animal skinned, Hjalmar?” He is thwarted by a misconceived shot in the back from Peter, but this inspires a new height of refreshing heroism that Lugosi may never have achieved on screen again. After urging the couple to go, he flips the switch that primes the dynamite and with the satisfying epitaph “It has been a good game”, he blows up the house, Ulmer making what seems cunning use of WWI trench explosion stock footage. In a train epilogue, Peter reads to Joan a review that accuses his novels of being far-fatched. Not that we care, as we’ve just seen a bravura example of lead horror actors enjoying an entertaining battle of wills discarding the humdrum need for realism.